This project is great if you want a cute alternative to treat bags! Wrap paper around the paper maché cone(s), trimming excess where needed. Adhere in place. Embellish the outside of the cone(s) with strips cut from the stack (adhere them around the top section of the cone(s) as shown) as well as paper rosettes. 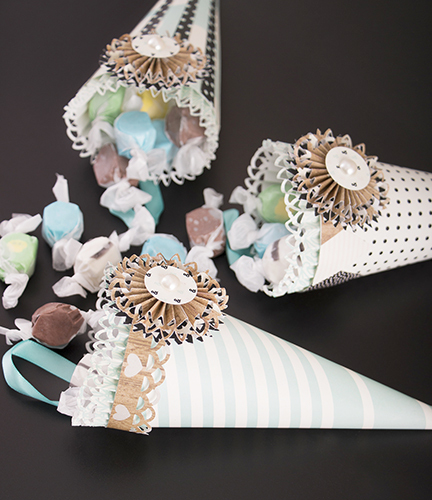 Add a few pearls to the embellishments on the cone(s). Attach a section of ribbon to the inside of the cone (one on each side) using hot glue. Looking to make several cones? Try using a paper hat as the template to keep the cost down and the results amazing!